There are two types of viruses that most people are familiar with: the kind that makes people sick and the kind that makes our computers go haywire. However, a third form of virus is just as infectious: an intellectual virus. In 1898, Friedrich Loeffler and Paul Frosch found evidence that the cause of foot-and-mouth disease in livestock was an infectious particle smaller than any bacteria. This was the first clue to the existence of biological viruses, genetic entities that lie somewhere in the grey area between living and non-living states. Viruses depend on the host cells they infect to reproduce. When found outside of host cells, viruses exist as a protein coat or capsid. One could make general comparison to how a seed works. The capsid encloses either DNA or RNA, which is the blueprint of the virus. While in this form outside the cell, the virus is metabolically inert. Once a capsid attaches to living cell and ejects its DNA or RNA code, the virus germinates and begins its destructive work. The term “computer virus” is credited to Grace Hopper. She found that a moth had landed in between the solenoid contacts in the Mark II Calculator, a massive analog computer at Harvard University designed by Howard Aiken. Hopper removed the squashed moth and annotated her log book with an entry (along with the moth fastened to the page). Computer viruses didn’t become a real problem unto DOS-based computers began to proliferate. The file structure utilized by these machines made it relatively easy in 1986 for the maker(s) of the “Brain” virus to play havoc with the boot sectors on floppy disks. 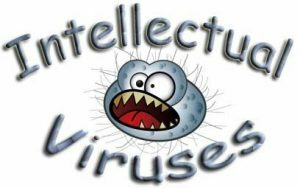 Intellectual viruses (IVs) don’t require DNA or microchips for transmission. They pass from one mind to another through various forms of spoken or written communications. What makes these ideas intellectual viruses is the fact that they are in error or serve no meaningful purpose. Just like the other two viruses, their only purpose is self propagation. Here are three IVs that might be hiding somewhere in your gray matter. I could have selected from a long list of old wives tails. I chose these three because they can be verified with common-sense thinking. The Great Wall of China is the only man-made structure that can be seen from space. What make this IV believable is the understanding that the Great Wall is the longest barrier that man has ever created. However, length does not matter when you’re trying to see something from space that is only a few feet wide. It is far easier to spot something like a man-made lake or city. Anyone looking at satellite images on Google Earth can see the difficulty of spotting Great Wall of China from any distance. We only use 10% of our brains. Studies of patients with brain damage suggest that damage to almost any area of the brain has specific and lasting effects on mental, vegetative and behavioral capabilities. Because the brain is divided up into performing certain tasks, it cannot be said that the mind only smells, sees, tastes, or senses touch at 10% of its capability. I guess what makes this IV wishful thinking is that we all have a wealth of mental capabilities yet to be unlocked. Water drains clockwise in the Northern Hemisphere and counter-clockwise in the Southern Hemisphere due to the Earth’s rotation. The main factor that propels that belief is action of weather cyclones, which follow this pattern in both hemispheres. Cyclones are guided by the earth’s rotations and the resulting Coriolis effect. The Earth’s rotation is too weak to affect the direction of water flowing down in a drain. The direction of the flow depends of the structure any given fixture. A test in a few washrooms will show that water whirlpools both ways. One of the main reasons error proliferates so easily is people don’t take much offense when they are provided with erroneous information. I take great offense when I discover someone has provided me with false information. I feel as if my mind has suffered vandalism. A few years ago, I received an email that contained a link to a news story that seemed to have a strong connection to end-time events. I added the link to the RR News page. A couple of hours later, I received an email from some who pointed that the news story was bogus. It turns out it was produced by someone who got his kicks from creating false news stories and passing them off as credible. I think anyone spreading lies in this manner should be dealt with as if he or she were a child molester. Many of mankind’s ills began with someone making a conscious decision to corrupt the truth. It should come as no surprise that God includes lying in His list of offenses worthy of hell fire. Your mind is a special gift from God. It can potentially store 100 trillion thoughts. All that capacity for memory storage does us no good if we fill our minds with garbage. It’s important to take measures that prevent bad data from entering our gray matter. The first step toward protecting our minds against falsehood is to realize there is an enemy who seeks to enslave us. Most of the world is under the control of some type of demonic delusion. No one on this planet should be trusted by his or her word only. Everything needs to be verified with facts and with the Word of God. One of the reasons I don’t have a statement of faith on the site is because I don’t want to create any reason for people to trust what I have to say. If you like to be spoon fed from so-called experts, you’re eventually going to be served error. The Bible is very specific about the need to guard our minds against false teachings. Paul sternly told the new church under his authority that they should conform every thought to the teaching of Christ. It’s so important to know the truth. If you know the truth, you can instantly detect a lie. The Treasury Department doesn’t train its agents to detect counterfeit bills by showing them fake ones. They give them the genuine bills and instruct them on its security features. Once the agents become familiar with the real thing, they will be able to immediately identify a counterfeit note. Mankind has a supernatural antagonist –the ultimate counterfeiter–who perpetrates viruses of both the cerebral and spiritual kinds. Sin is his tool to do the soul-killing job. His name is, of course, Satan. Sin is the disease that is species-wide. Both spirit and mind suffer from viruses that spin from this terminal illness. Because of sin and the deluding influences of the viruses it produces, evil men and seducers grow worse and worse, deceiving and being deceived (2 Tim. 3:13). The reasoning ability of the mind becomes increasingly unable to discern. The spirit becomes callous, the conscience seared. It joins with the sin-virus of lying wickedness that eventually produces a reprobate mind. Such minds lusts to heap deception upon deception. The truth can’t be found in such a sin-darkened condition. “But the natural man receiveth not the things of the Spirit of God: for they are foolishness unto him: neither can he know them, because they are spiritually discerned” (1 Cor. 2:14). The virus that results from sin dulls the intellect. It causes the person to become gullible, tearing down defenses that would otherwise guard the thinking processes. The people of Hitler’s Nazi Germany constituted one such mass example. They became convinced that the Fuhrer was their messiah and that the Jew was the cause of all that was wrong with the world. Satan is the father of all such intellectual viruses. There are so many things in this world today that make no sense. People’s dealings with each other make for news that ranges from amusing to bizarre –from merely confusing to horrific. Intellectual viruses are the manifestation of things within humanity that need correcting. Few would deny that many things do need change for the better. There is one cure for this deadly malady, and one cure only for what ails Planet Earth’s inhabitants. About those who have taken the cure, God’s Word, the Bible, says the following: “For God hath not given us the spirit of fear; but of power, and of love, and of a sound mind” (2 Tim. 1:7).